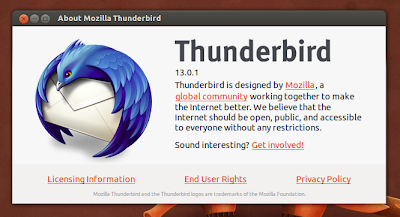 The latest version of default Ubuntu email client application Mozilla Thunderbird now lands on Ubuntu repository. It means that you will get the latest version when installing Thunderbird or running update on your system. Well, if you haven't known before, Thunderbird now offers to share for file larger than specified file size (via Thunderbird Preferences). By now, Thunderbird uses YouSendIt service which provides free plan with 2GB disk spaces, 50 MB maximun file size, and 1 GB traffic for a month. No Comment to " Install Mozilla Thunderbird 13.0.1 in Ubuntu or Linux Mint "